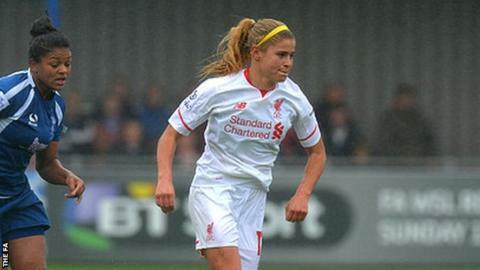 Liverpool Ladies' new striker Rosie White says joining the club was an "awesome option". The 22-year-old New Zealander signed for the Women's Super League reigning champions in July after representing her country at this summer's World Cup. Speaking to BBC Sport, White admitted her future was unclear when she travelled to the tournament in Canada. "Leading into the World Cup, I didn't really know where I was going to end up afterwards," White said. "I was hoping to sign a contract in Europe and in England especially. Liverpool has got such a big name so it was one of the clubs I had my eye on. "I'd wanted to go to a top club and Liverpool was a pretty awesome option and the fact that it all worked out for me was pretty exciting." White has scored twice in six matches for Liverpool Ladies since joining in July. The forward, who played in two of her country's three World Cup matches, says the move came about after she contacted Liverpool manager Matt Beard. "He got back to me straight away and we were both on the same page," she said. "I fitted his criteria and so it all happened really quickly after that." Liverpool are experiencing a difficult season in WSL1 and with five matches left, trail leaders Chelsea by 10 points. With three key players out injured, White said the squad have had to pull together. "There have been a few ups and downs since I've been here but it's been a good challenge," she said. "We've been trying a few new things and just trying to solve a few little problems. We're getting on the right track. "We've got a big goal to do really well in the cup and a point to prove for the rest of those league games and show that we are still one of the best teams."